The Customize Windows > Computer and Internet > Cloud Computing > What is Mobile Device Management (MDM) Solution? 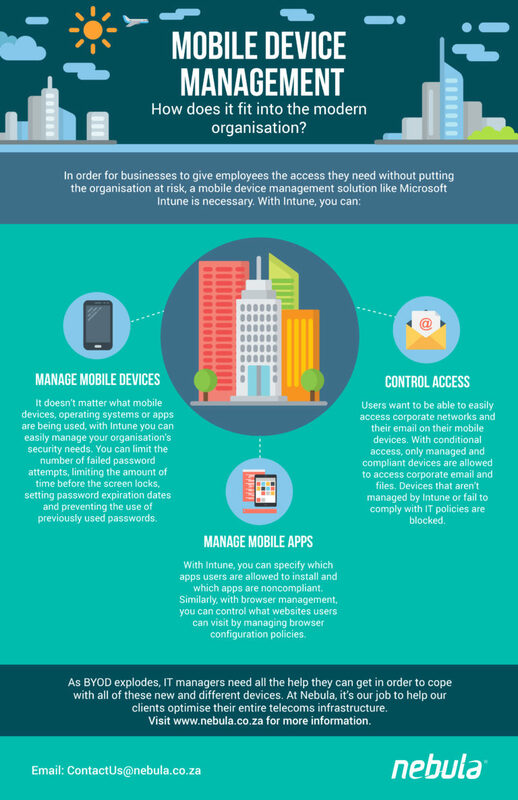 What is Mobile Device Management (MDM) Solution? Mobile Device Management (MDM) means the software and hardware way for centralized management of the mobile devices usually in BYOD deployment. Previously we discussed about Bring Your Own Device (BYOD) and pointed the security issues. MDM solutions adress Mobile Application Management (MAM), Mobile Content Management (MCM) and Identity and Access Management (IAM) for a wide range of mobile devices and platforms and is called Enterprise Mobility Management. In this platform, the administration can control the distribution of software, data and policies, as well as the protect data on these devices. In the event of device loss, sensitive data can be wiped off from the console. Why the Mobile Device Management (MDM) Solutions Becoming Common? While laptops still represent a typical mobile IT infrastructure of the companies, many mobile devices are still designed primarily as a consumer device. So the operating systems usually not designed to be MDM-oriented. But the users/employees are increasingly demanding access to company software and data using their own device. This practice, which is known as BYOD is increasingly spreading. It is undisputed, that this practice is increasingly posing a risk for many organizations. Lost devices from the government organization may mean more wider danger. The security needs of the organizations must be satisfied, a requirement-oriented version of the operating system must be used, whose security measures were not circumvented by jailbreaking or rooting. The devices must be unlocked at power on by pin input. Data, but also software on these devices must be secured against loss (backup) and, if necessary, can be reloaded (update over the air). Stolen or lost devices must be able to be cleaned up (remote lock and wipe), access rights to central data must also be managed via the mobile devices (policy & provisioning) and the costs and use of the devices must be monitored (logging & accounting ). In addition, problems of new recruitment of personnel are to be solved as well as staff departures and the subsequent required deletion of company data and software on the devices. Finally, the possibility of private use must continue to be given, especially in the case of private devices, and, as the case may be, there should be a separation between private and business use. IT departments should also be aware of the secrecy of telecommunications, which usually prohibit access to their personal data on the mobile device. These days, MDM solutions can be either software as a service (SaaS) and on-premise software. It is quick to setup the SaaS systems, offer easier updates with lower capital costs with almost no need of regular software maintenance. Mobile Device Management (MDM) is a practical need. MDM is built with the idea of containerization. Email, documents, and enterprise applications are encrypted and processed inside the container to ensure that the corporate data is separated from personal data. However, MDM does have a part of tracking the hardware and location for good intent (helpful in case of device loss) which does need ensuring security from being mishandled. This Article Has Been Shared 821 Times! Articles Related to What is Mobile Device Management (MDM) Solution? With Bokeh You Can Create Interactive Tables and Charts. Here is How to Install Bokeh Python Visualization Library in Jupyter Notebooks. In this final part of Analysis of Docker in DevOps, we discussed matters like Employee Onboarding, Platform independence, Logging, Configuration Management. Here Are Some Methods of Encryption in Cloud Object Storage. Examples Given With OpenStack & IBM Cloud, Although the Technology Behind is Complex for IBM. Title: What is Mobile Device Management (MDM) Solution? Cite this article as: Abhishek Ghosh, "What is Mobile Device Management (MDM) Solution?," in The Customize Windows, April 3, 2019, April 18, 2019, https://thecustomizewindows.com/2019/04/what-is-mobile-device-management-mdm-solution/.